Air Max Flies Faster and Farther! Long distance ring gets maximum airtime. Easy to catch and easy to throw. Soft outer material with flex grip comfort. Harder plastic core for distance and durability. Fly faster and farther! 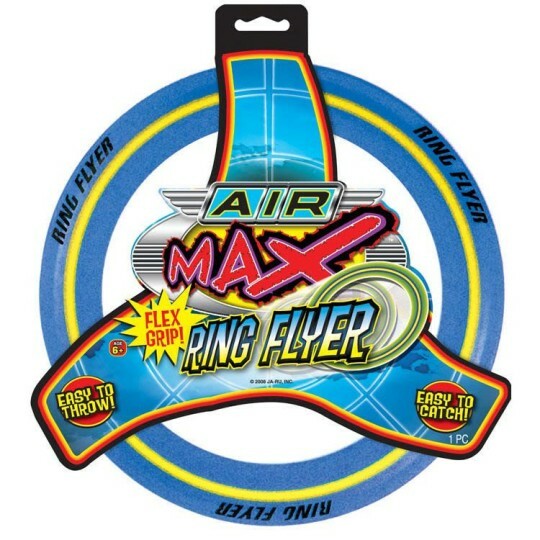 Get maximum airtime with this long distance flying ring. The 11-1/2" outer diameter ring features a soft rubberized inner and outer ring molded over a plastic core. Inside diameter is 8-1/2". The softer material makes it easier and more comfortable to catch, while the harder plastic core maximizes flight distance and durability. Color may vary. When I was 7 I received the Ja-Ru Ring Flyer from my Uncle. I didn't expect that this frisbee would go far but when I threw the frisbee it went further than any of the frisbees I have ever thrown. My Ring flyer is starting to wear out so I am going to buy another one. These are great for kids. They are easy to throw and catch and even little kids can throw them pretty far which keeps them interested.